Our Abpromise guarantee covers the use of ab54253 in the following tested applications. 1/50 - 1/200. Use 10µl of the suggested working dilution to label 1x10^6 cells in 100µl. Receptor for complement C3Dd, for the Epstein-Barr virus on human B-cells and T-cells and for HNRPU. Participates in B lymphocytes activation. Mature B-lymphocytes, T-lymphocytes, pharyngeal epithelial cells, astrocytes and follicular dendritic cells of the spleen. Genetic variations in CR2 are associated with susceptibility to systemic lupus erythematosus type 9 (SLEB9) [MIM:610927]. Systemic lupus erythematosus (SLE) is a chronic autoimmune disease with a complex genetic basis. SLE is an inflammatory, and often febrile multisystemic disorder of connective tissue characterized principally by involvement of the skin, joints, kidneys, and serosal membranes. It is thought to represent a failure of the regulatory mechanisms of the autoimmune system. Belongs to the receptors of complement activation (RCA) family. Contains 15 Sushi (CCP/SCR) domains. Human peripheral blood lymphocytes stained with ab54253 (red line). Human whole blood was processed using a modified protocol based on Chow et al, 2005 (PMID: 16080188). In brief, human whole blood was fixed in 4% formaldehyde (methanol-free) for 10 min at 22°C. Red blood cells were then lyzed by the addition of Triton X-100 (final concentration - 0.1%) for 15 min at 37°C. For experimentation, cells were treated with 50% methanol (-20°C) for 15 min at 4°C. Cells were then incubated with the antibody (ab54253, 0.1μg/1x106 cells) for 30 min at 4°C. 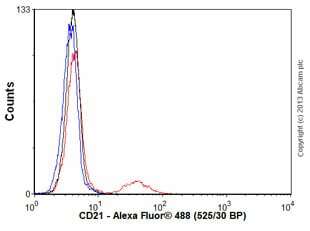 The secondary antibody used was Alexa Fluor® 488 goat anti-mouse IgG (H&L) (ab150113) at 1/2000 dilution for 30 min at 4°C. Isotype control antibody (black line) was mouse IgG1 [ICIGG1] (ab91353, 0.1μg/1x106 cells) used under the same conditions. Unlabelled sample (blue line) was also used as a control. Acquisition of >30,000 total events were collected using a 20mW Argon ion laser (488nm) and 525/30 bandpass filter. Gating strategy - peripheral blood lymphocytes. Publishing research using ab54253? Please let us know so that we can cite the reference in this datasheet. There are currently no Customer reviews or Questions for ab54253.